Press conference of the campaign Human Rights Defenders for Free Elections. Minsk, September 12, 2016. The human rights defenders noted with regret that the elections did not meet international standards for free and democratic elections. The finding is based on an analysis of data collected by the campaign’s observers deployed across the country to observe every phase of the elections. 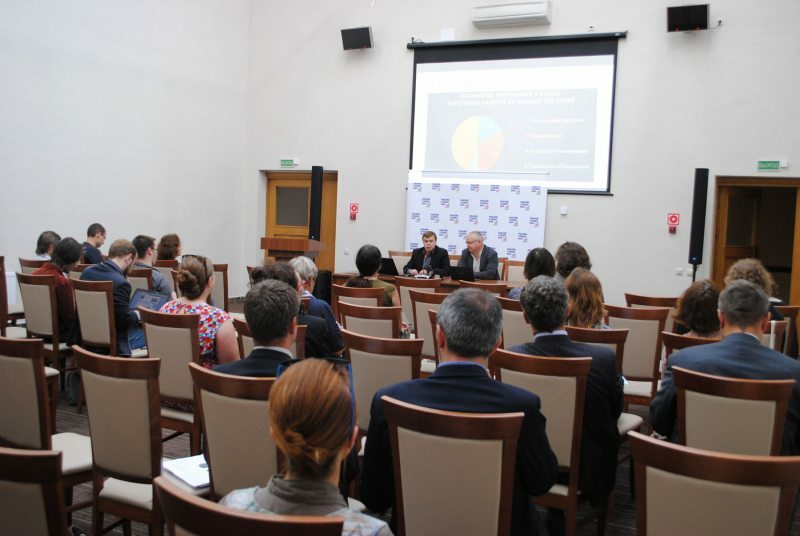 Since the official launch of the parliamentary elections, the campaign involved 55 long-term observers, who were accredited with the DECs to cover more than 70% of the country’s voters. During early voting, observation was carried out in 182 PECs, and on Election Day the observation covered 350 PECs across the country. Reports were processed on a daily basis, which allowed to identify the general trends in the organization of the electoral process and assess the level of electoral violations. Describing the process of formation of territorial, district and precinct election commissions, Uladzimir Labkovich stressed that the campaign observers were primarily interested in how the key actors of the electoral process could be represented in them. 353 representatives of political parties were nominated to the district commissions, 639 — from citizens, 140 — by labor collectives and 925 — by non-governmental organizations. “These figures show that the proportion of political parties is essentially low, that, in principle, the Belarusian political parties are not the main actors to claim membership in the election commissions. Public associations still remain key contenders for commission seats,” said the human rights activist. As a result of the formation of the TECs and the DECs, representatives of political parties accounted for only 24.2% and 13.6%, respectively. The total percentage of representatives of opposition parties in the composition of the TECs and DECs was insignificant — 5.4% and 1.8% respectively. Speaking of the precinct election commissions, the total number of members of opposition parties in them amounted to 53 persons, or 0.08% of the total number of PEC members. “Belarus has developed a system with the main pro-government associations (Belaya Rus, Belarusian Republican Youth Union, Belarusian Women's Union, Public Association of Veterans, and the Federation of Trade Unions) are the main channels for the formation of election commissions by the representatives of the authorities,” Labkovich said. “Based on our analysis, we can say that in 90% of the electoral districts there were no systemic changes in the composition of commissions. They have the same people who simply ‘migrate’ from one commission to another: for example, today they are representatives of a labor collective and tomorrow they are from Belaya Rus, and in the next elections — from the Federation of Trade Unions. The commissions are kind of parallel structures of administrations and local authorities, in a way copying the work of the executive vertical,” Uladzimir Labkovich concluded. Speaking about the positive aspects of the stage of nomination and registration of candidates, Aleh Hulak mentioned a fairly quiet nature of these procedures and the fact that the locations for the collection of signatures were more convenient than in the previous campaigns. At the same time, the human rights observers are still dissatisfied with the closure nature of the whole signature verification procedures and other information about the nominees. “In our view, the procedure for checking signatures and other documents submitted to register the candidates allows the authorities to manipulate in one direction or another — either helping someone be selected or prevent other from being registered. And this, of course, does not correspond either to the Belarusian legislation or international standards, and requires adjustments in further work with the electoral legislation,” Hulak said. Stressing the positive figures for the number of registered candidates (521 registered, 93 denied, 16 withdrew their applications), he noted that the election campaign as a whole was still barely visible. The observers see several main reasons for this: the absence of government funding, which was previously granted at least for the dissemination of the candidates’ printed programs; summer as an improper period for campaigning; unwillingness of a considerable part of candidates to conduct campaigning, who did not even register their electoral funds. The negative aspects of the campaigning phase were the numerous cases of censorship of programs and speeches of candidates, illegal barriers to some candidates in the publication of their campaign materials. The closeness of election commissions resulted in many breaches in the days of early voting, the human rights activists stated. They documented two main types of violations: enforced early voting for securing voter turnout with the use of administrative resources and overstated turnout by the election commissions. 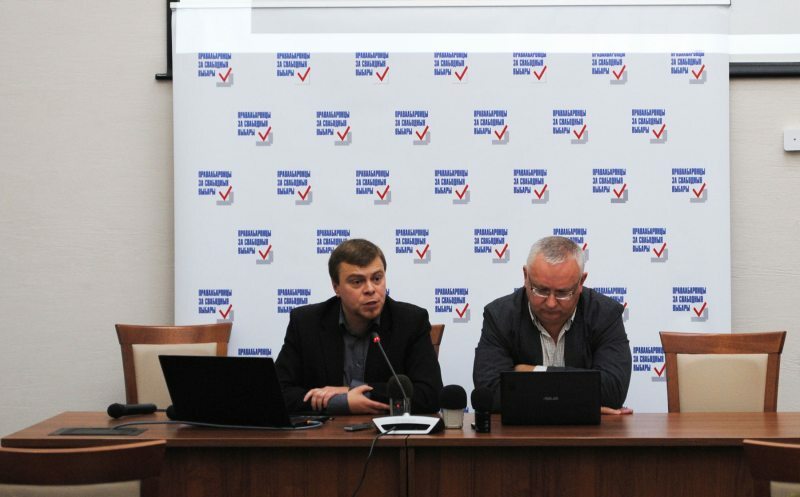 “It is clear that the administrations of enterprises and education institutions are in fact election officials, even though the law does not vest such a function, moreover, it is strictly forbidden to act in such capacity, this is an outrage against the law,” Uladzimir Labkovich said. The human rights activists reported an unprecedented mismatch in the figures on voter turnout from election commissions and independent observers. For example, in the fifth day of early voting, the difference in these data was 31%. According to the campaign, the total difference in early voting turnout was 14%. Meanwhile, in the parliamentary elections of 2012 this difference was 10.4%. “As we can see, the early voting as we know it, has completely discredited itself, and in fact is no longer early voting. After all, theoretically, this is an exceptional form of voting for citizens who, for whatever reasons, are unable to vote on Election Day. And what we have now are actually six days of regular voting. And this type of early voting cannot continue to exist, because it does not allow to monitor the safety of the ballot boxes and the ballots, but creates space for forced voting,” Labkovich said. Noting the high technical level of voting procedures on Election Day, the human rights activists reiterated their long-standing concerns associated with the lack of transparency of electoral procedures. These include bans on observers’ access to voter lists; abuse of mobile voting procedures, which is more difficult phase to observe, to overestimate the number of voters; the opacity of the vote-counting procedures, as stated by 95.31% of the campaign’s observers. The campaign’s observers filed a total of 102 complaints. Of these, only 18 were met. “Based on the interpretation of the Belarusian legislation, unfortunately, the majority of disputes are closed for judicial review, with the only possibility to appeal to election commissions. And we are still to witness the fact that the candidates who officially lost the elections, will not be able to judicially challenge these results,” Uladzimir Labkovich said. “On the eve of the election campaign, the Central Election Commission announced that it would introduce a positive practice — more information about complaints, a database will be set up to feature complaints and results of election disputes. The amendments were enforced by a decision of the CEC, and part of that decision directly says that the executive committees on their official websites must publish all decisions of the territorial and district commissions on election disputes. However, in practice this was not done, we observed a fragmented picture of such publications, which does not allow a detailed analysis of these complaints. Therefore, we can only talk about those complaints, which were filed by our observers,” Aleh Hulak added. “Unfortunately, in this election campaign, we have not seen the progress that we were promised on the eve of elections. There were some positive steps. We can say that there were attempts to demonstrate improvement. But facts are stubborn, and we saw what we saw, and we have presented this to you. In general, the system of conducting elections has remained the same,” Hulak said. More details on the campaign’s findings can be found in the final analytical report. The results of election observation will be used in further work with a view to making the necessary changes to the Electoral Code. The coordinators of the campaign Human Rights Defenders for Free Elections expressed the hope that the Central Election Commission and the new Parliament will have the political will and the opportunities to return to the promises to continue the work of the interdepartmental working group set up to improve the electoral process. 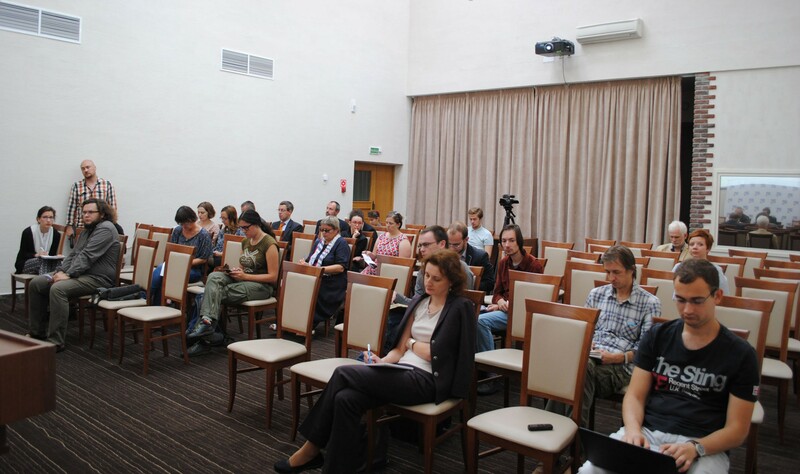 The next few years without elections, according to the human rights defenders, provide a good opportunity for a detailed discussion and amendments to the electoral procedures in Belarus.